In the previous post we learned how the company staffed up for growth while keeping a modest profile that was relatable to most bike shop clients. In the final post of the series we’ll learn how innovation ramped up for the company. 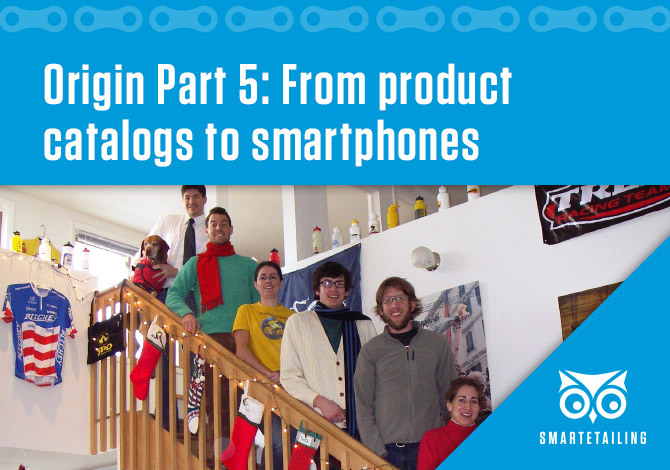 The first iteration of SmartEtailing’s software focused on its product catalog, which launched with 50 products. Today that product library houses hundreds of thousands of items from hundreds of the industry’s premier brands. Beyond developing and offering retailer websites, SmartEtailing has evolved its services to provide Buy Local Now product locator tools, integrations with local point of sales systems and supplier warehouses, MAP protection, retailer marketing service and a Supplier Fulfillment drop ship program. More recently, SmartEtailing has evolved its platform to work on smartphones and adapt to current online retail standards. The incorporation of new marketing strategies into the company are helping retailers grow their local online sales to compete in a fast-changing cycling market. As a technology company, change is constant and staying on top of the latest trends in web development is key. Wheel & Sprocket, a longtime client of SmartEtailing, left the platform and then returned once they saw the pace of innovation speed up in recent years. Noel Kegel, who now heads the multi store retailer with locations in Wisconsin and Illinois started by his father Chris, said having a mobile-friendly platform was the reason he signed back on. Wheel & Sprocket also says SmartEtailing's platform has the best integration with partners in the industry including Trek, QBP, Shimano, and many others. As you learned in earlier posts, SmartEtailing was built from the ground up by an in-house software development team. The application was purpose-built exclusively to serve bicycle retailers which make it a truly unique experience. The company still builds and maintains this proprietary software, but has of course evolved significantly from the early days. Today the company uses the most widely adopted software development methodology, called Agile, to deliver valuable features to clients in small pieces. The entire application is being systematically transformed into a new microservices architecture which will unlock endless future innovations. SmartEtailing continually reinvents itself while holding true to the core values and original vision that the co-founders dreamed up in 1999. Many of the original retailers who funded the startup are still clients today, and are counted among the nation’s premier independent bicycle dealerships. During the 20 years since SmartEtailing’s founding, the bike industry has experienced monumental change. There was no guarantee that Mark and Barry’s vision would endure. But it did endure and even thrived. SmartEtailing continues to innovate and grow. Today the company works in some way with nearly half of all local bike shops in the United States while also offering important connectivity between those bike shops and their partner suppliers. At all levels of the organization there is gratitude for the bike shops who have chosen to partner with SmartEtailing today or in the past. The company is committed to showing appreciation by being a great partner as bike shops navigate the path to the industry’s future.